I find it an amazing gift to assist souls to cross to the light. When someone dies, their soul may choose to not cross to the light, usually because they are concerned about loved ones who will be left behind. Their guides continue to encourage them to cross to the light; however, after a period of time passes, they may need help from someone on the Earth plane. What I find is that a soul that hasn’t yet crossed to the light feels more of a kinship with those who are living than to those who are on the other side of the veil (e.g., guides, deceased loved ones). They often need permission and encouragement to leave this dimension and go “home” to the light. We, as Lightworkers, can help them do this. There is no obligation to do this. But for those guided to assist souls in this way, it is very simple and takes only a few minutes. It can be done in groups or when alone. I teach my students how to do this during my Thursday evening Psychic Development, Mediumship, and Channeling course, and we do this as a group whenever we have a Channeling class and during Development Circles (also known as Spirit Circles). Take a moment to quiet yourself. Close your eyes and take a few deep breaths. Ask your guides to be present. 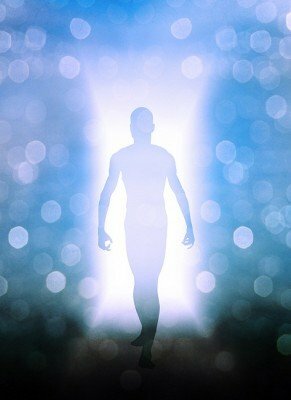 Ask for their help and then tell your guides that you are only willing to connect with entities that are of the light or souls that haven’t yet crossed to the light and that are ready to do so. Imagine a white light above you that’s whiter and brighter than anything you’ve ever seen on the Earth plane. Pull that white light down through your crown chakra (top of your head) and let it flow down through your body. Send a stream of that white light out your 3rd eye, heart chakra, or palms of your hands. Send it out in front of you. Imagine it elongating until it becomes a column or vortex of bright swirling light. Tell them to look around for a little spot of light. Tell them that the light can be any color . . . white, yellow, pink, purple, blue. Tell them that if there are multiple lights, they should go toward the brightest of these lights. Tell them to start moving toward the light. Reassure them that once they have crossed to the light, they may come back and visit at any time. Reassure them that there is great love waiting for them on the other side. If you feel that a soul is feeling reluctant, provide needed reassurance (e.g., those they are leaving behind will be fine). For psychics/mediums who are sensitive to energy, you will feel a “release” once the soul has crossed. If you are crossing more than one soul, then you may feel multiple releases. And don’t be surprised if you hear a “Thanks!” from those you have helped cross. When you feel the process is complete, start pulling the white light back toward you. Thank your guides for helping you with this process. Take a deep breath, open your eyes, and feel the appreciation that your guide(s) and this soul(s) are giving you for doing this service. No one is expecting you to assist souls cross to the Light. then simply tell the soul to go away. Due to the Law of Free Will, they must abide by your wishes. then you can seek the assistance of someone who is willing to do this. I recommend that you contact Margaret McCormick at www.MargaretMcCormick.com. and then she and her Guides can assist a soul to cross, if needed. If you are in the Southern California area and would like to learn how to do this, I teach this technique during all of my Channeling classes. These classes are offered every 4th Thursday of the month, from 7:00-9:30 p.m. at the Impart Wisdom and Wellness Center, 540 N. Golden Circle Drive, Ste. 108, Santa Ana, CA. Please see my Calendar for more information about each of the classes scheduled at the IWWC. Hope we see you soon! There are MANY ways to help souls cross to the light. If you have your own method, feel free to use it.